QINGDAO, June 9 (Xinhua) -- Dazzling against the city skyline of Qingdao, fireworks lit up the faces of guests who traveled across the vast Eurasian continent to the coast of the Yellow Sea for the 18th Shanghai Cooperation Organization (SCO) summit, on Saturday night. It is the first such summit since the organization's expansion in June 2017 when India and Pakistan joined as full members. "Qingdao is a famous international sailing capital. It is from here that many ships set sail in pursuit of dreams," said President Xi Jinping at a welcome dinner Saturday evening. "The Qingdao summit is a new departure point for us. Together, let us hoist the sail of the Shanghai Spirit, break waves and embark on a new voyage for our organization." The Shanghai Spirit of mutual trust, mutual benefit, equality, consultation, respect for diverse civilizations and pursuit of common development, was stated in the Charter of the SCO, a comprehensive regional organization founded in 2001 by China, Kazakhstan, Kyrgyzstan, Russia, Tajikistan and Uzbekistan and later expanded to eight member states. This weekend Xi will chair the summit for the first time as Chinese president, which is attended by leaders of other SCO member states and four observer states, as well as chiefs of various international organizations. The event is reminiscent of the Boao Forum for Asia (BFA) held two months ago though the guests are different. On April 10, Xi addressed the opening ceremony of the annual conference of the BFA, attended by more than 2,000 people. In Boao, Xi unveiled new measures for expanding reform and opening up and heralded "a new phase of opening up" for common prosperity of both China and the world. The same spirit of openness and inclusiveness has continued in Qingdao, Shandong, the home province of Confucius. "An integral part of Chinese civilization, Confucianism believes that 'a just cause should be pursued for the common good' and champions harmony, unity and a shared community for all nations," Xi told the guests. "Its emphasis on unity and harmony has much in common with the Shanghai Spirit." At the summit participants are encouraged to gain consensus on building a community with a shared future for humanity and building a new type of international relations featuring mutual respect, fairness and justice, and win-win cooperation, said State Councilor and Foreign Minister Wang Yi when briefing the media last week. The two concepts have been catchphrases of Chinese diplomacy over the past five years. Though, they are not mere catchphrases, but ideas backed with pragmatic initiatives and concrete diplomatic moves. With the BFA conference hailing reform and opening-up and the SCO summit promoting regional security and cooperation, China will host another two major international events this year -- the Forum on China-Africa Cooperation summit to advance the Belt and Road Initiative, and the China International Import Expo for further market opening. "With the growth of national strength and international influence, China is more confident in raising new ideas on global governance," said Professor Zuo Fengrong with the Party School of the Communist Party of China Central Committee. "China's initiatives are aimed at an open, inclusive, clean and beautiful world that enjoys lasting peace, universal security and common prosperity." According to Wang, the Qingdao Declaration to be issued at the summit will call on all parties to continue the Shanghai Spirit. In his speeches at previous SCO summits, President Xi had repeatedly upheld the Shanghai Spirit, acknowledging its significance in forging a community with a shared future in the region, maintaining security and stability and promoting exchanges. "The 17-year-old Shanghai Spirit is in line with Xi's latest diplomatic vision," said Li Ziguo with the China Institute of International Studies, who also highlighted it as a platform for "building a community with a shared future for humanity." Under the guidance of the Shanghai Spirit, the region prospered with peace and stability, with countries in the region having settled complicated border issues, contained threats from terrorism, extremism and separatism, and launched initiatives of cross-border trade and infrastructure connectivity, often spearheaded by China. The SCO has grown to be an organization covering over 60 percent of the Eurasian landmass, nearly half the world's population and over 20 percent of global GDP. "The organization has demonstrated strong cohesion and increasing influence," said Konstantin Kokarev, head of the Centre for Asia and Pacific Region, Russian Institute for Strategic Studies, in an interview with Xinhua. 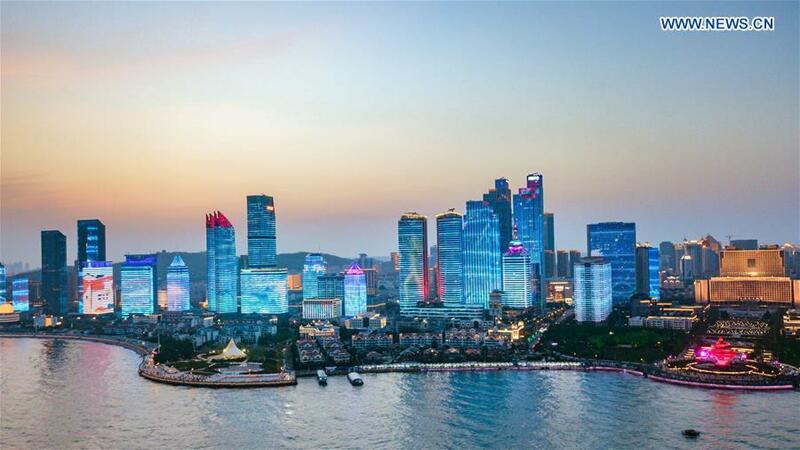 Qingdao is a symbolic choice to host this year's SCO summit, as it is at the eastern end of a vast railway network across Eurasia, and a logistics center linking the Silk Road Economic Belt with the 21st Century Maritime Silk Road. Sea cargo is transferred here to five international railway lines to countries in the western end of the continent, 30 days quicker than using sea routes alone. The vision of the Silk Road Economic Belt was first raised by Xi in Astana of Kazakhstan in September 2013, a few days before he first attended the SCO summit as Chinese president. It was later developed into the Belt and Road Initiative. "China's initiative brings great opportunity to the SCO," said SCO Secretary General Rashid Alimov. "The summit in Qingdao will also contribute to the implementation of the initiative." The initiative has become an important practice to materialize the vision of a community of a shared future for humanity. "China itself has engaged in profound cooperation with countries across the world. It will bring rich opportunities to connect the SCO with a broader part of the world," Kokarev said.